On Tuesday, May 22, 2018, students of Professor Alexandra Lewis' "The Music of Maurice Ravel" seminar, along with other Conservatory students and faculty, produced an All-Ravel concert that included a large and varied segment of the composer's oeuvre and featured performances by Paul Sperry and Beatrice Long. No. 3. from "Tonadillas al estilo antiguo"
Achilles Liarmakopoulos is professor of trombone studies at the Conservatory of Music of Brooklyn College. Filmed by ONErpm Studios at the Conservatory of Music of Brooklyn College, October 2016. Dr. Cornel West recording the podcast. 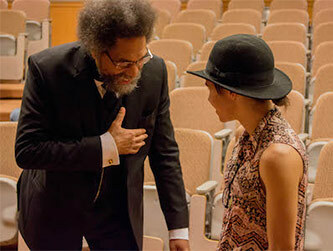 Dr. Cornel West speaking to a Brooklyn College student. Dr. West spoke with students in advance of the Brooklyn College Big Band's Whitman Theatre concert, which featured the Brooklyn premiere of Arturo O’Farrill's The Cornel West Concerto. The podcast was produced by Miguel Macias. Performed Tuesday, April 19, 2016, by the HAL conTEMPO Trio—Hila Zamir, clarinet; Adam von Housen, violin; Laurence Cummings, piano—in Studio 312 at the Conservatory of Music of Brooklyn College. Mezzo-soprano Shawn Palmer and pianist Matthew Lobaugh performed Ravel's Shéhérazade as part of an all-Ravel concert at the Conservatory of Music of Brooklyn College, Studio 312, on Monday, May 18, 2015.